From the 7th Annual Hot Wheels Collectors Nationals in 2007 in Dearborn, MI. 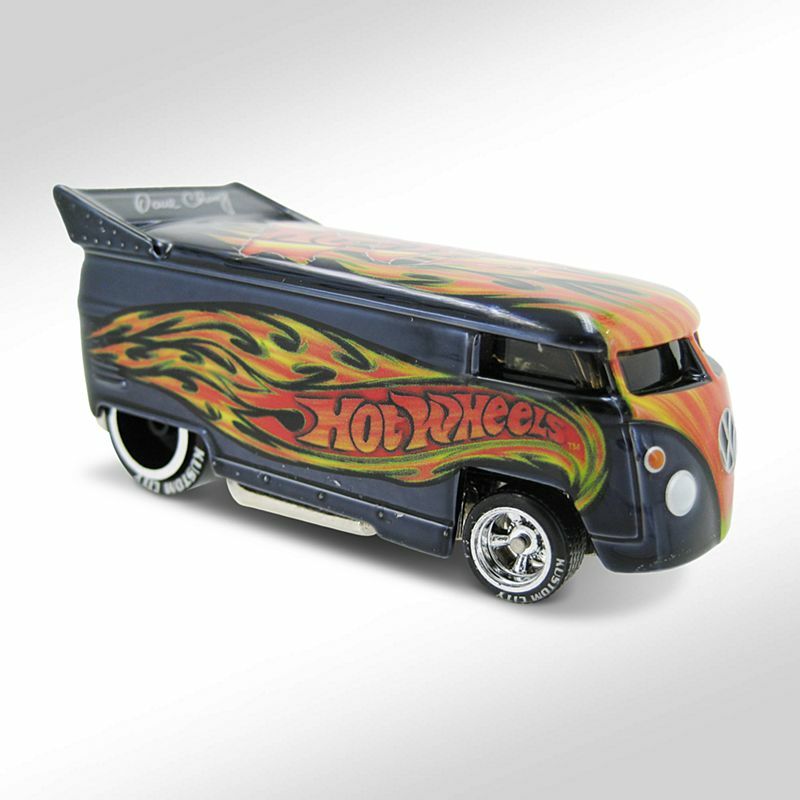 This edition of the Drag Bus shows up for HWC™ Series Six in Spectraflame® orange with ghost flames on the sides and smoke-tinted windows. 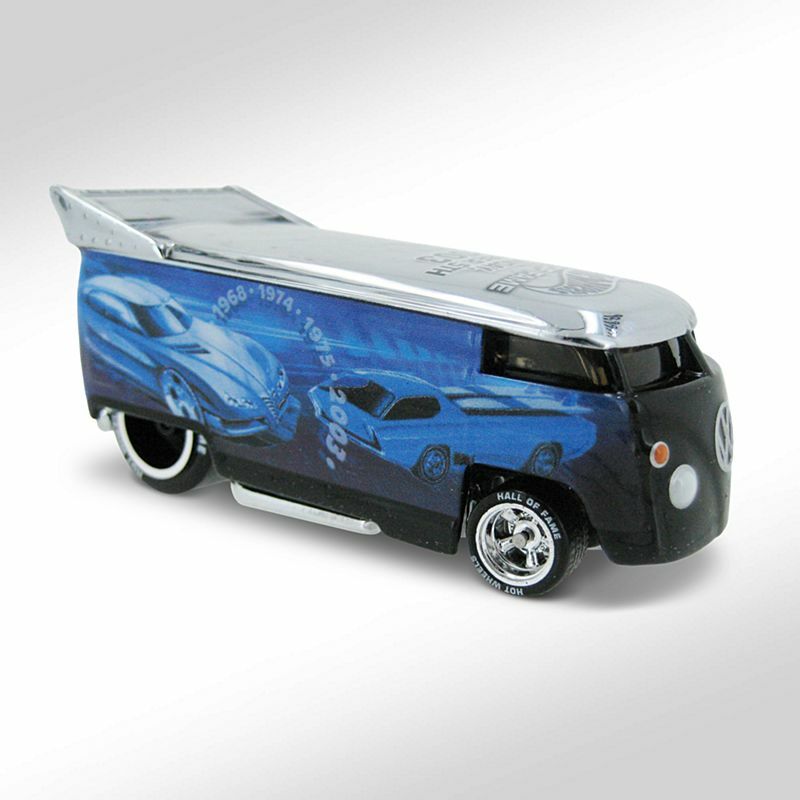 The body opens to reveal the big, chunky engine that is part of the chrome-plated, full-metal chassis. 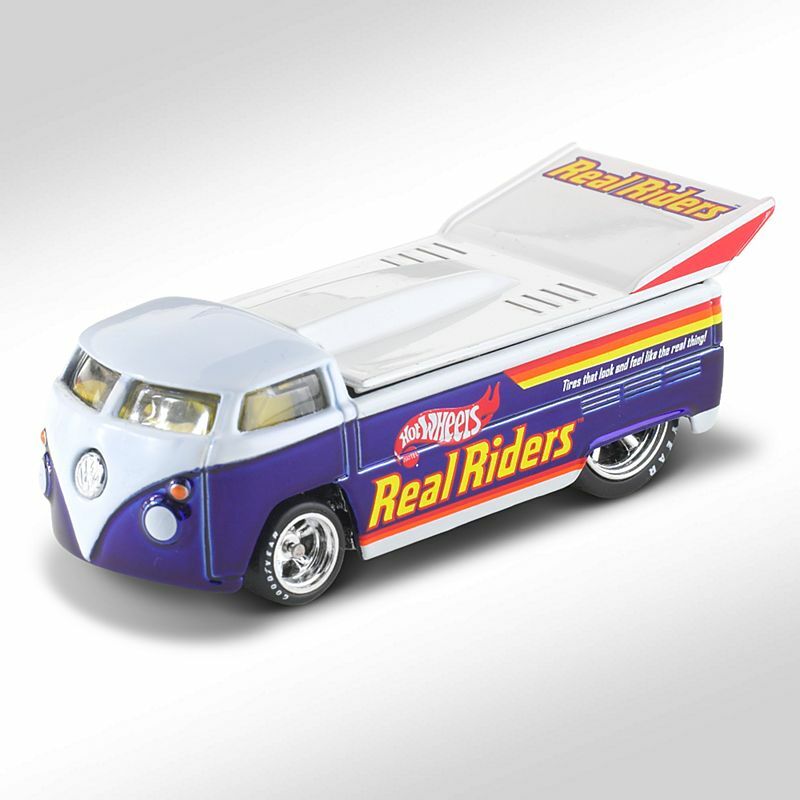 And it all rolls on Real Riders® five-spoke wheels in the front and fatties in the back. Suh-weet! 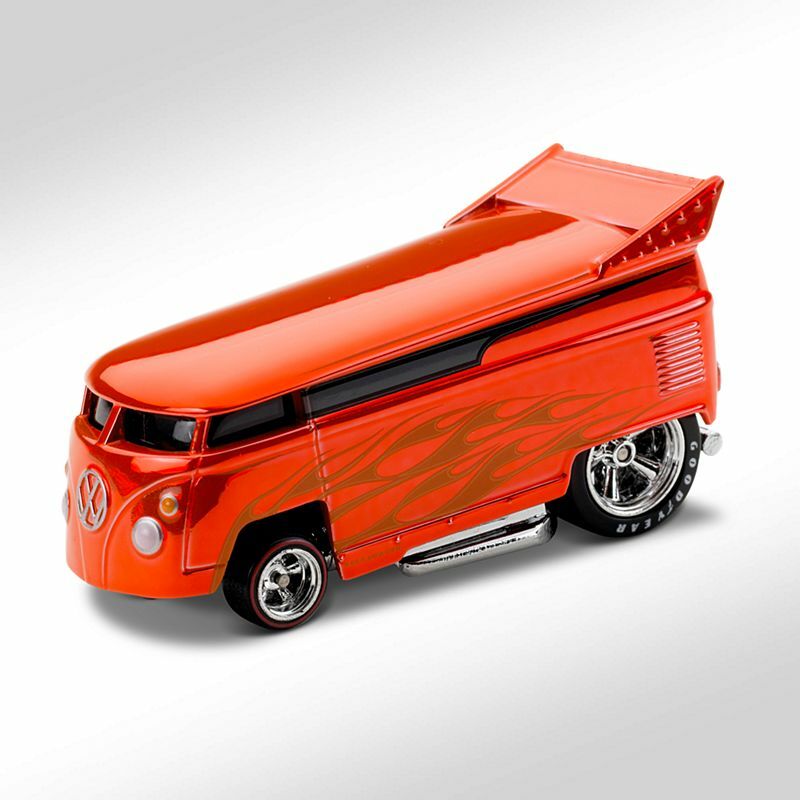 Created and released to commemorate the 10th anniversary of the Volkswagen Drag Bus, this edition was offered only to Red Line Club™ members at HWC™. Produced in quantities as ordered, it was offered at a low price as a special “thank you” to club members who had been with the club since its inception in 2002. This was one of two cars offered to 2012 Red Line Club members for use with Rewards points earned by making purchases during the RLC Priority Window. 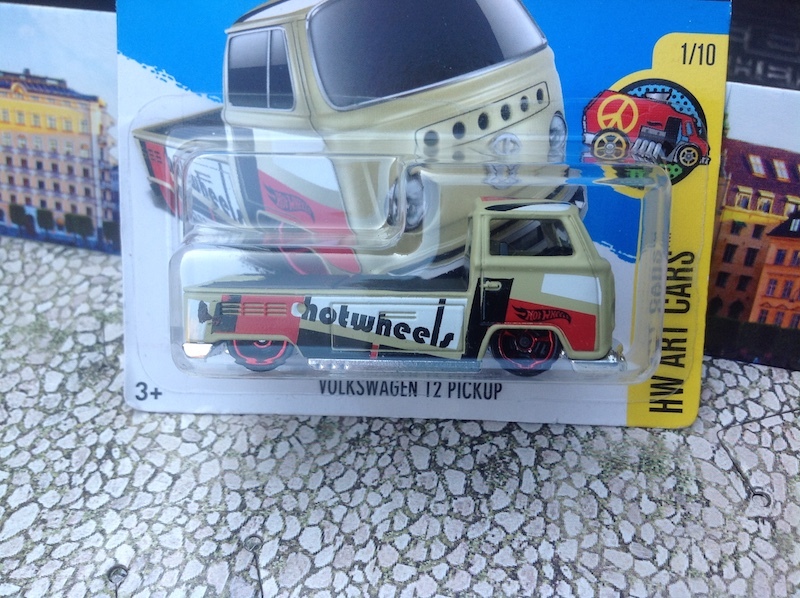 This is the Volkswagen Drag Truck. 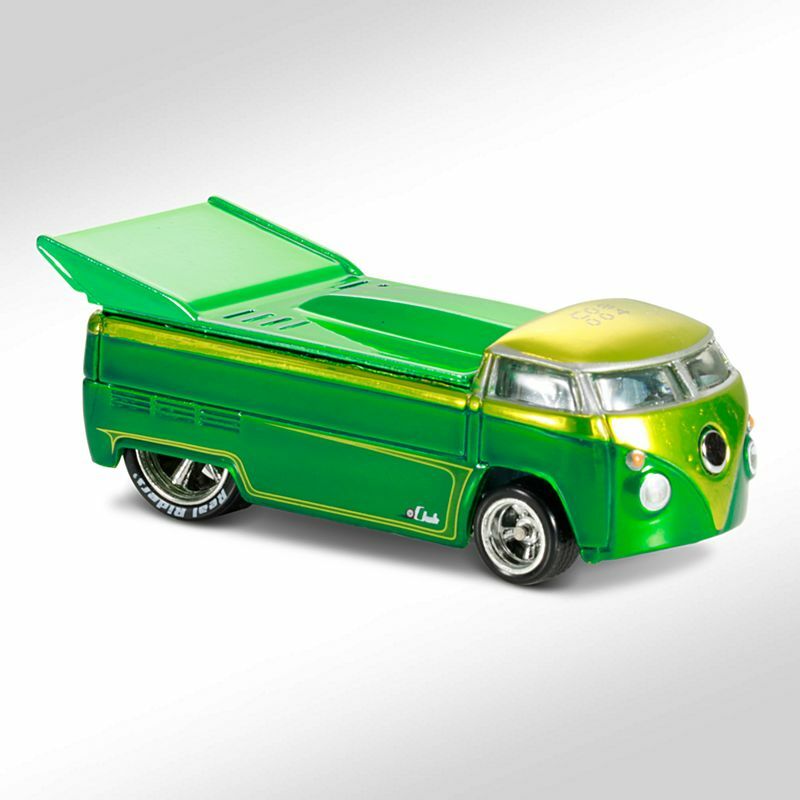 It’s hard to beat the Volkswagen Drag Bus when it comes to pure collectability. A heavy mass of metal with loads of real estate for graphics, no HWC™ Series year has been complete without it. 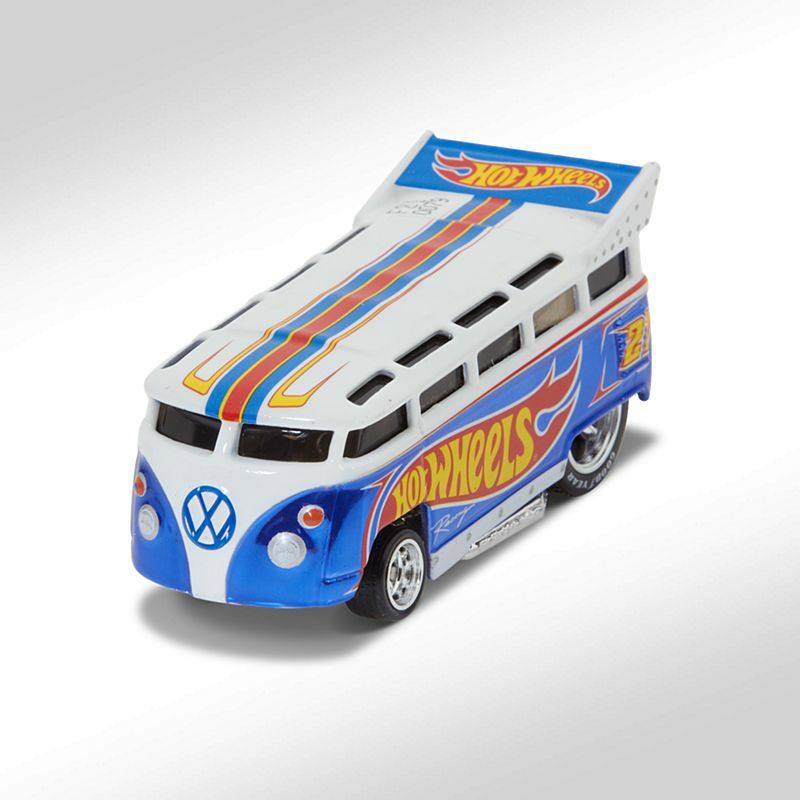 For the Hot Wheels® 40th anniversary celebration, we give you our HWC™ Series Seven Real Riders® Volkswagen Drag Bus. 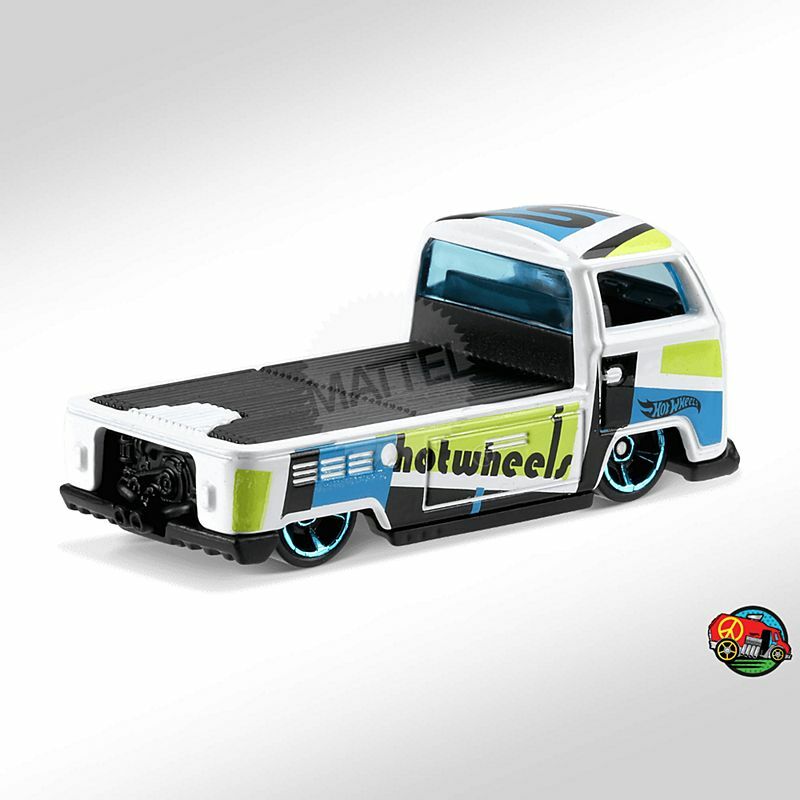 You can never get your hands on Hot Wheels prototypes, right? 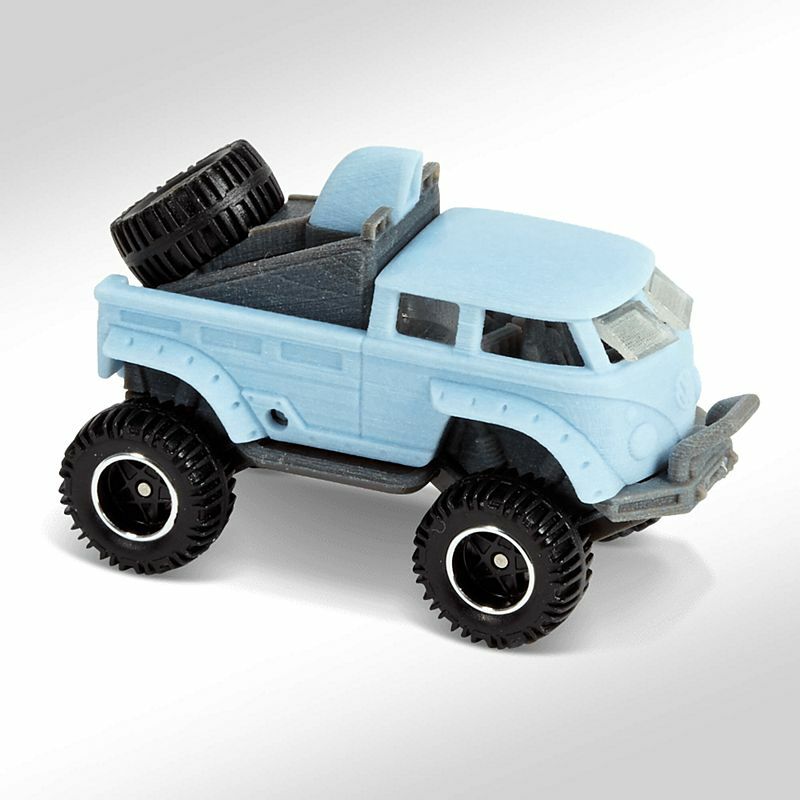 Wrong!Hot wheels offered this 3D Printed Prototype of designer Phil Riehlman’s, the Volkswagen T1 Rockster. 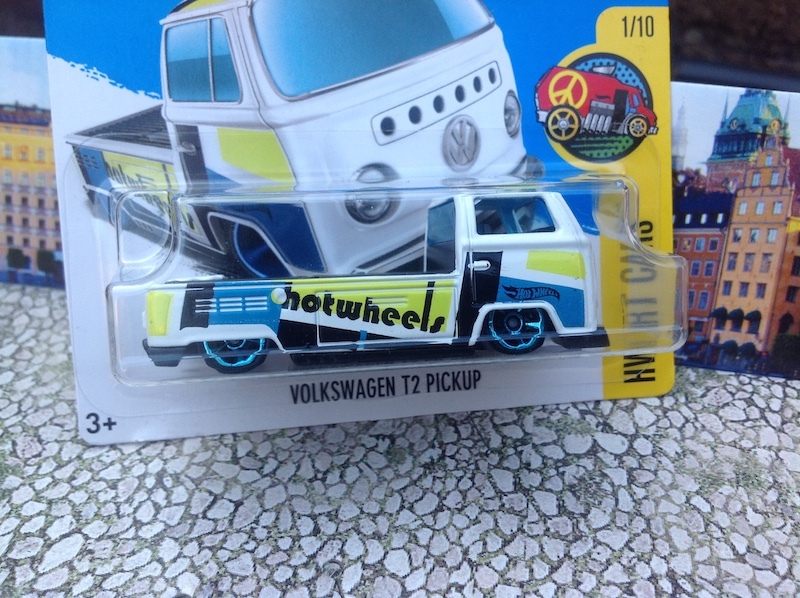 Hot wheels Volkswagen t1 prototype, only 250 made. 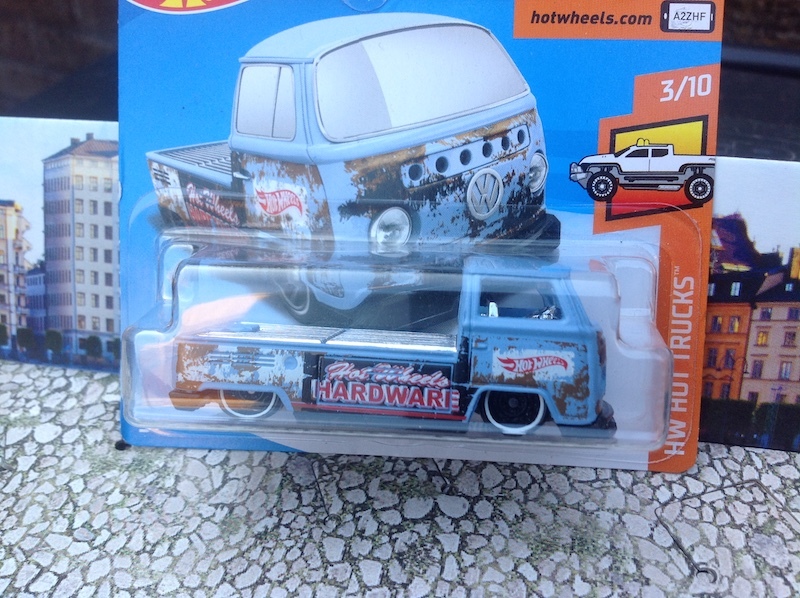 For the 2007 Red Line Club™ at HotWheelsCollectors.com, Hot wheels commandeered the Customized VW Drag Truck to use as the RLC™ Exclusive club car! 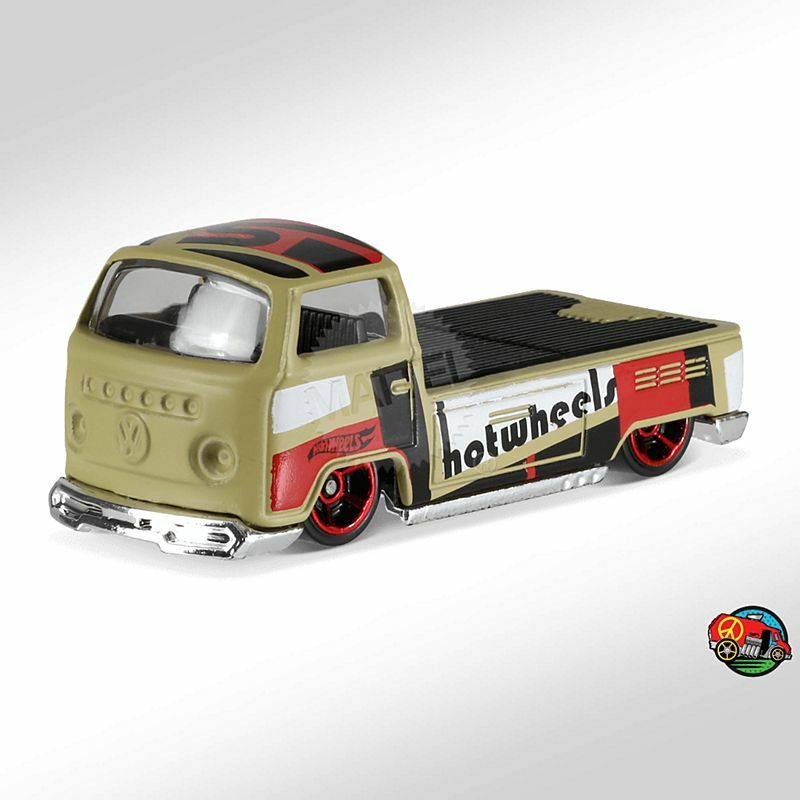 Hot wheels added some big ‘ol Real Riders® five-spoke wheels with red stripes to the back — and a chrome-plated, full-metal chassis. This was the first release for the first 4,000 to join or renew, in chrome. 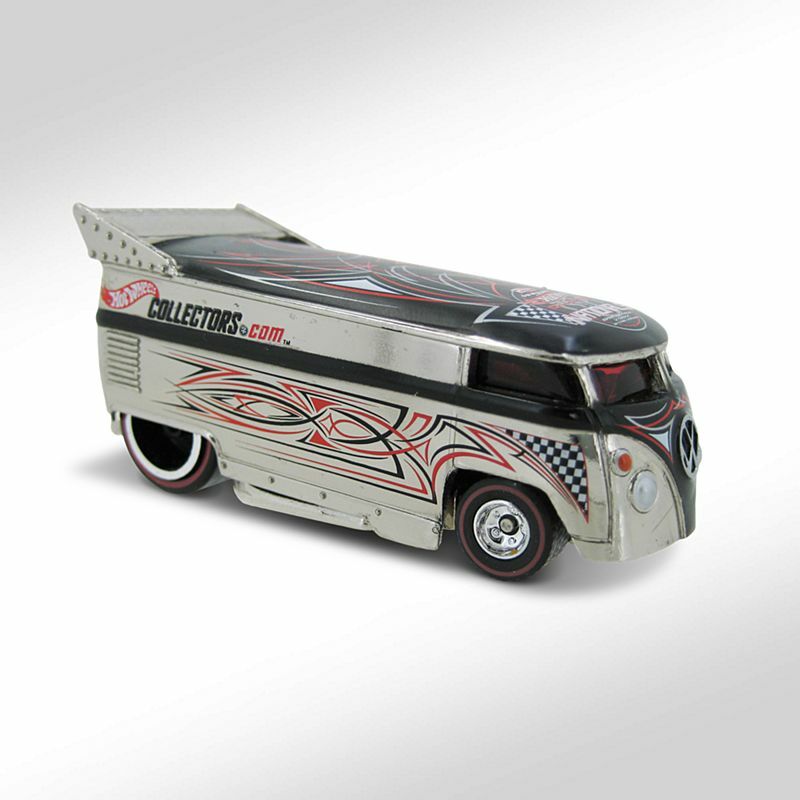 Top and cover are in black, with centered metallic red stripe in honor of Redline® era wheels. Only this version has the red stripe. 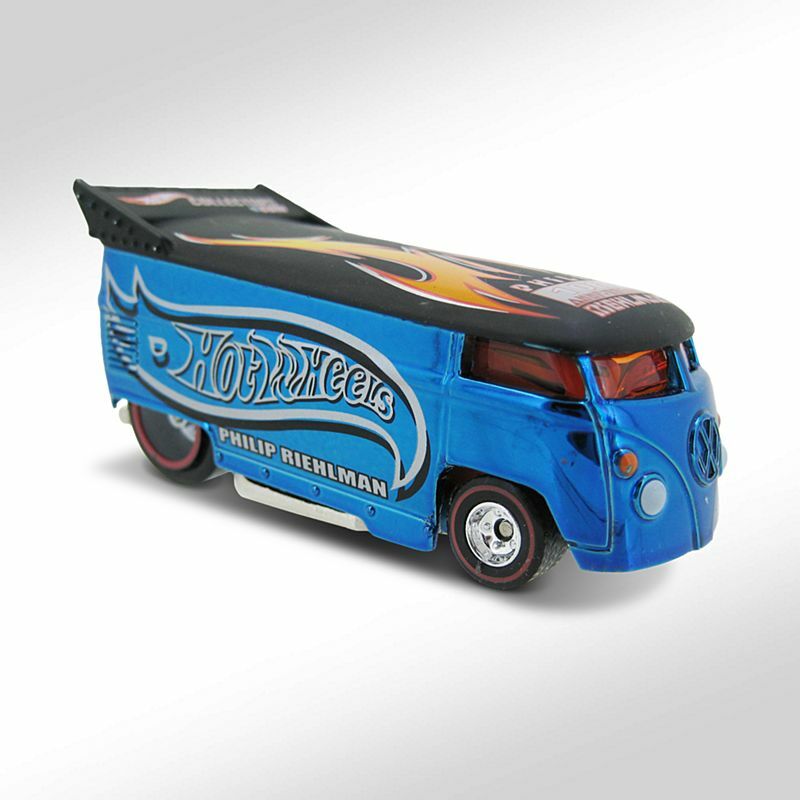 For the 2007 Red Line Club™ at HotWheelsCollectors.com, Hot wheels commandeered the Customized VW Drag Truck to use as the RLC™ Exclusive club car! 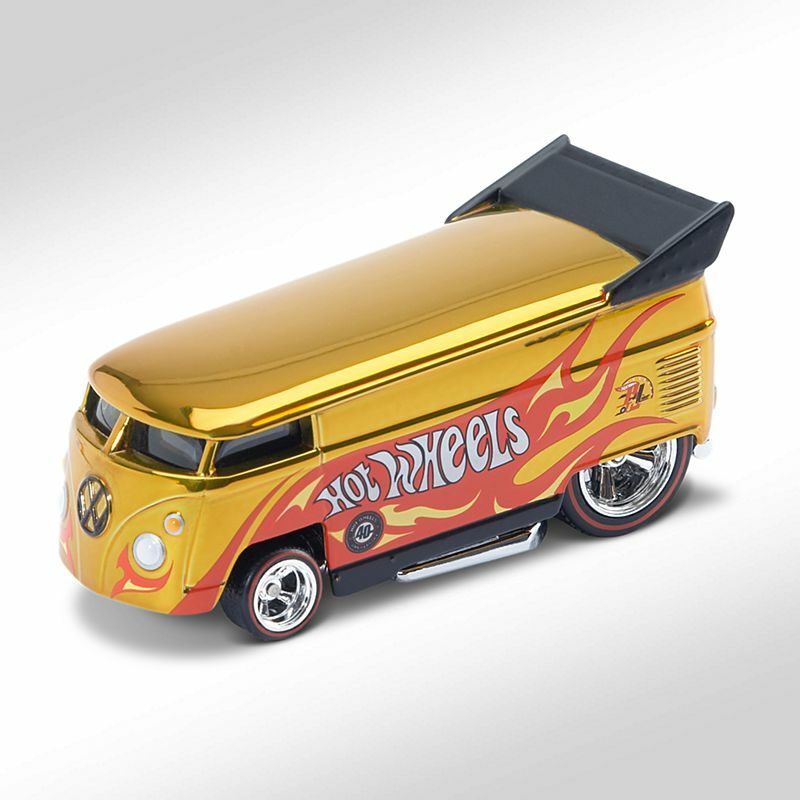 WeHot wheels added some big ‘ol Real Riders® five-spoke wheels with red stripes to the back — and a chrome-plated, full-metal chassis. 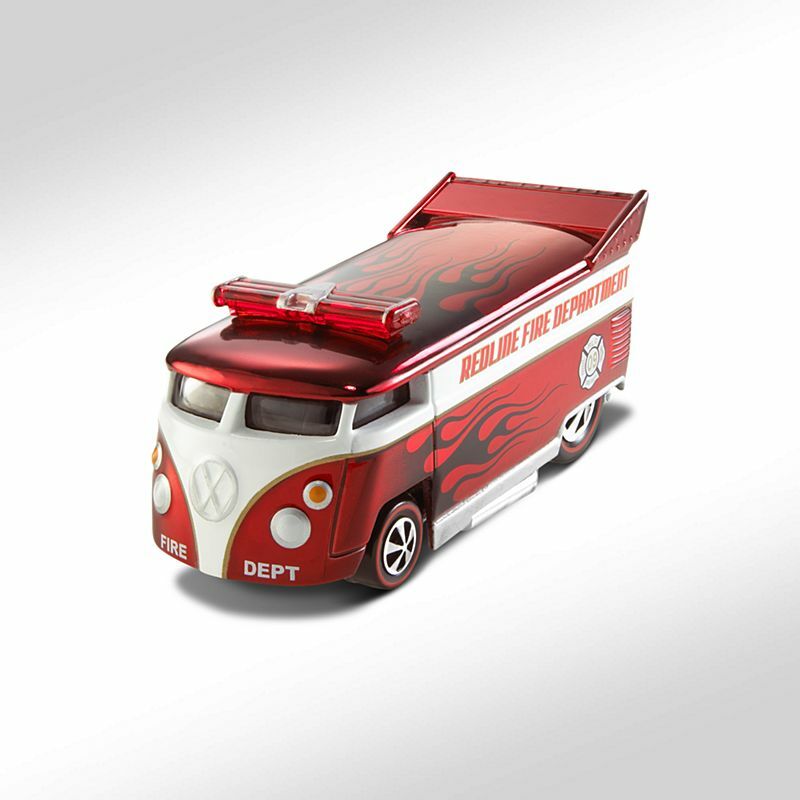 For the second group of 5,000 to join or renew, the Drag Truck was finished in Spectraflame® red. Top and cover are in black, with centered white stripe. 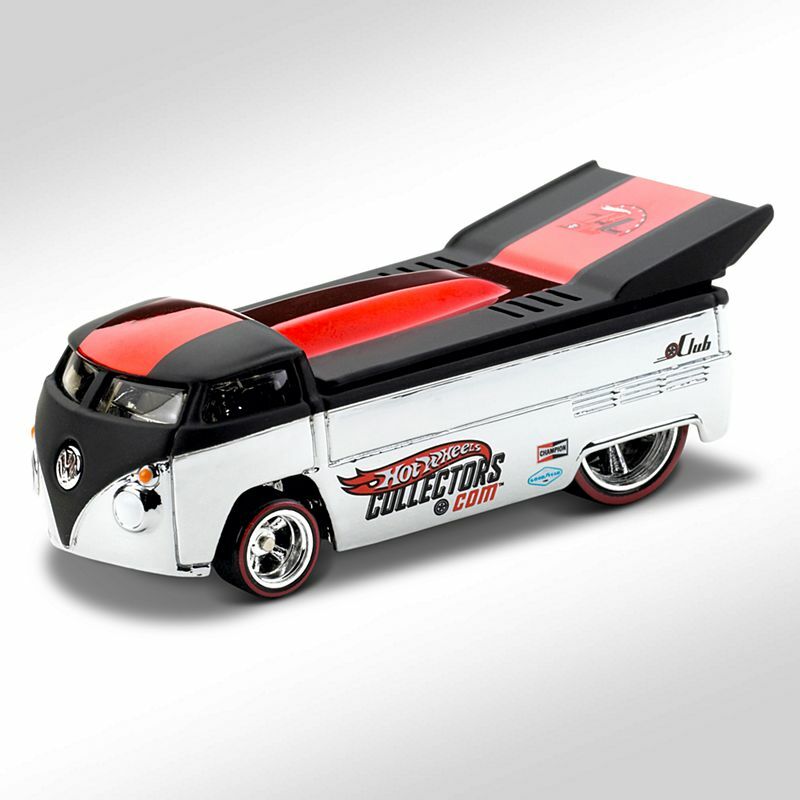 The 2009 Red Line Club went big for its 8th year with the Volkswagen Drag Bus as club car. 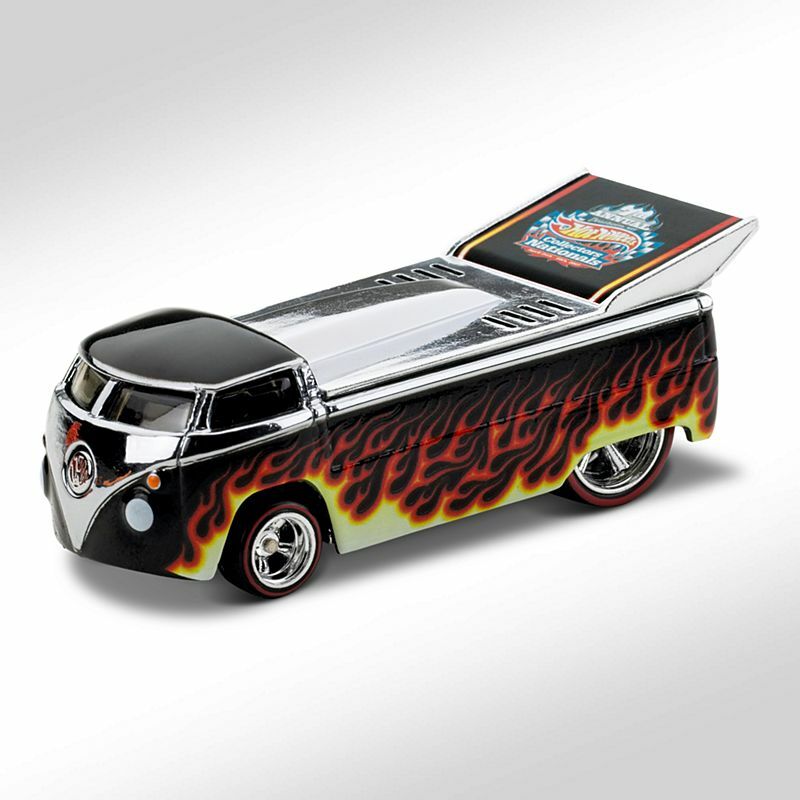 Besides being one of the most popular castings with collectors, the versions of the Drag Bus released for the membership were all a modified version of the tool — with siren bar on top, plus a different themed deco for each of the four variations. This was the fourth version — Spectraflame® yellow with Taxi deco — which was issued to the fourth group (7,000 members) to renew or join for 2009. This was the third version — Spectraflame® olive with Military deco — which was issued to the third group (6,000 members) to renew or join for 2009. This was the second version — Spectraflame® red with Fire Department deco — which was issued to the second group (5,000 members) to renew or join for 2009. This was the first version — Spectraflame® smoke with Police Department deco — which was issued to the first group (4,000 members) to renew or join for 2009. 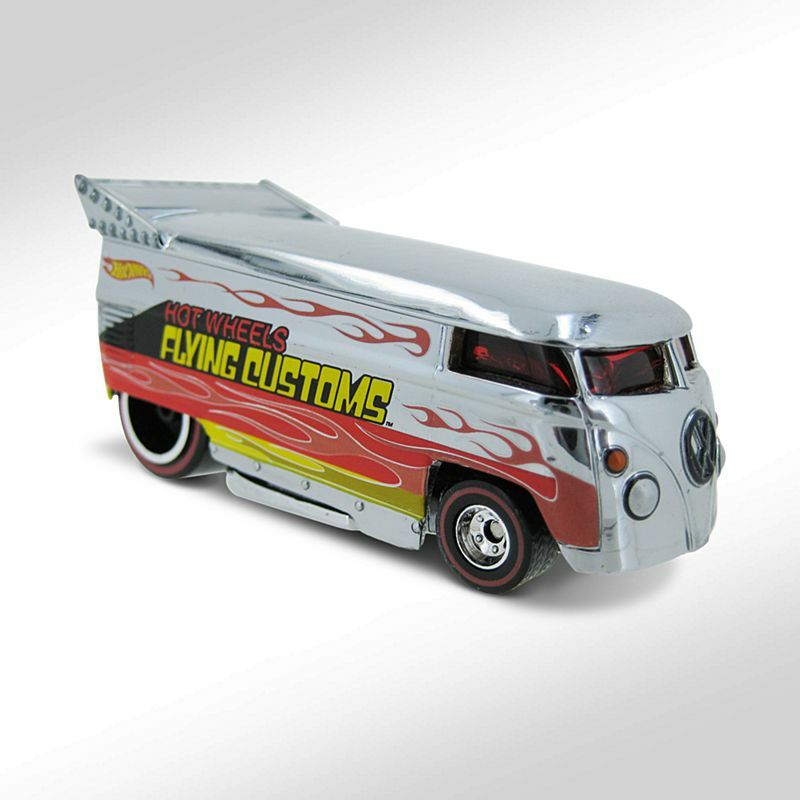 The Real Riders® Customized VW Drag Truck has become quite the looker! 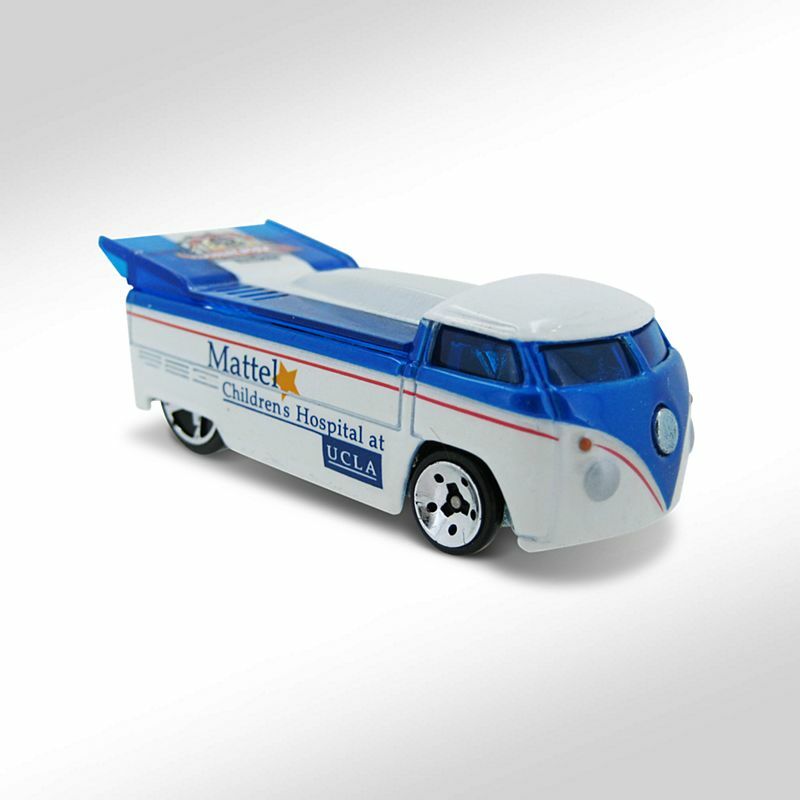 After first appearing as a 2004 First Editions™ model, it was clear this little vehicle was one to watch. 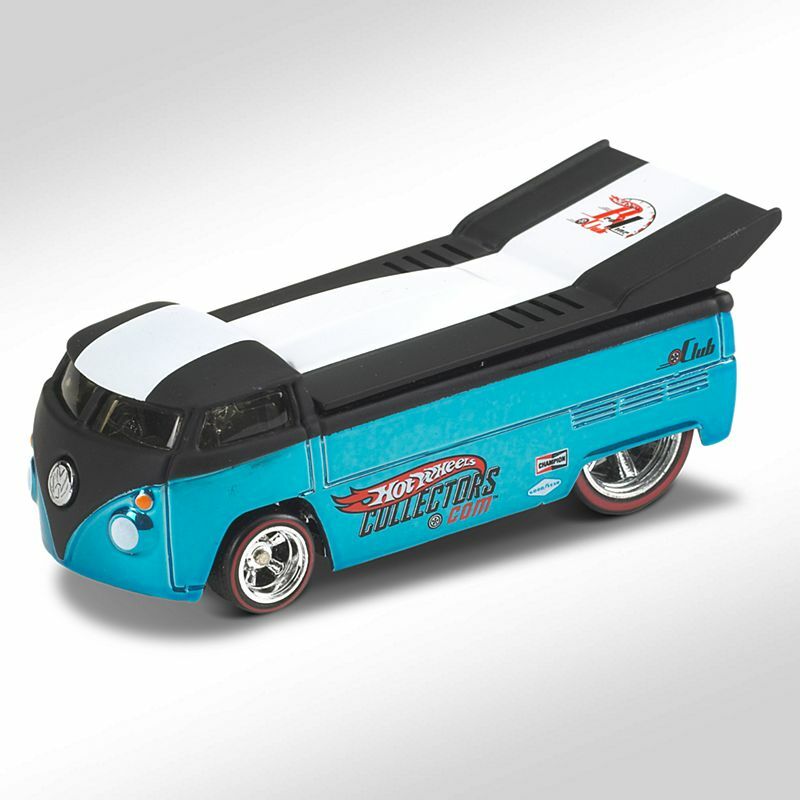 After all, it is the younger sibling of the collector-favorite Customized VW Drag Bus. So what makes this model so hot? For starters, newly tooled Real Riders® five-spoke wheels – custom designed just for the Truck! This instant classic shines in a brilliant Spectraflame® dark blue finish. 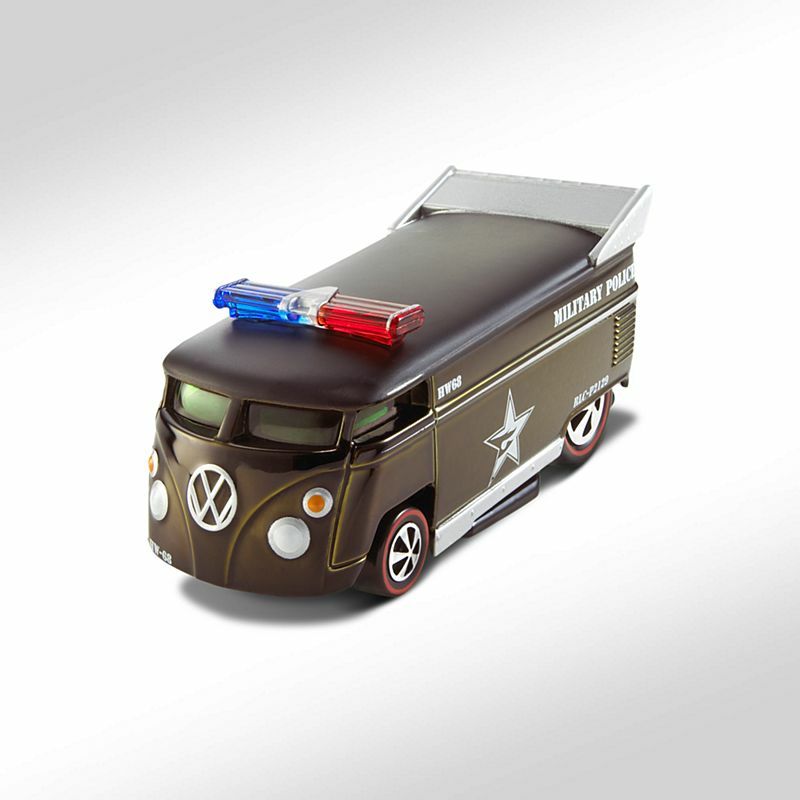 For the 2007 Red Line Club™ at HotWheelsCollectors.com, we commandeered the Customized VW Drag Truck to use as the RLC™ Exclusive club car! 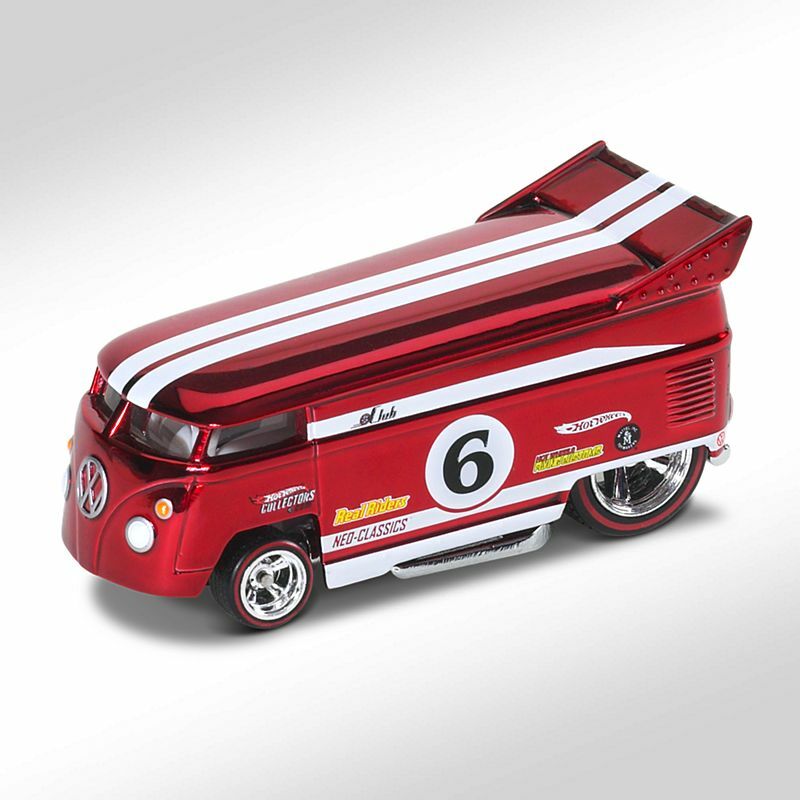 We added some big ‘ol Real Riders® five-spoke wheels with red stripes to the back — and a chrome-plated, full-metal chassis. 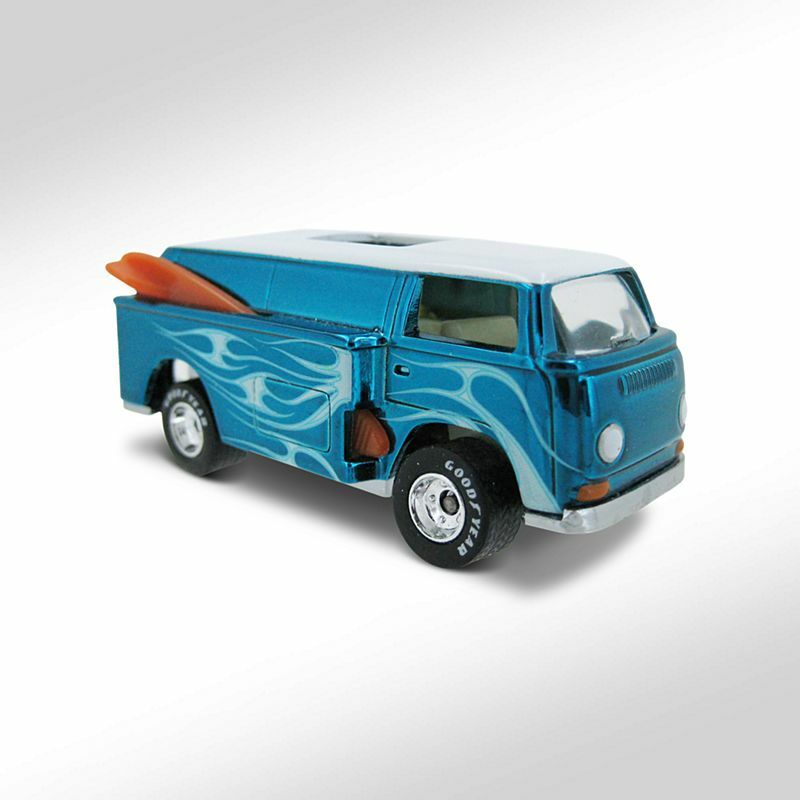 For the third group of 6,000 to join or renew, the Drag Truck was finished in Spectraflame® ice blue. Top and cover are in black, with centered white stripe. 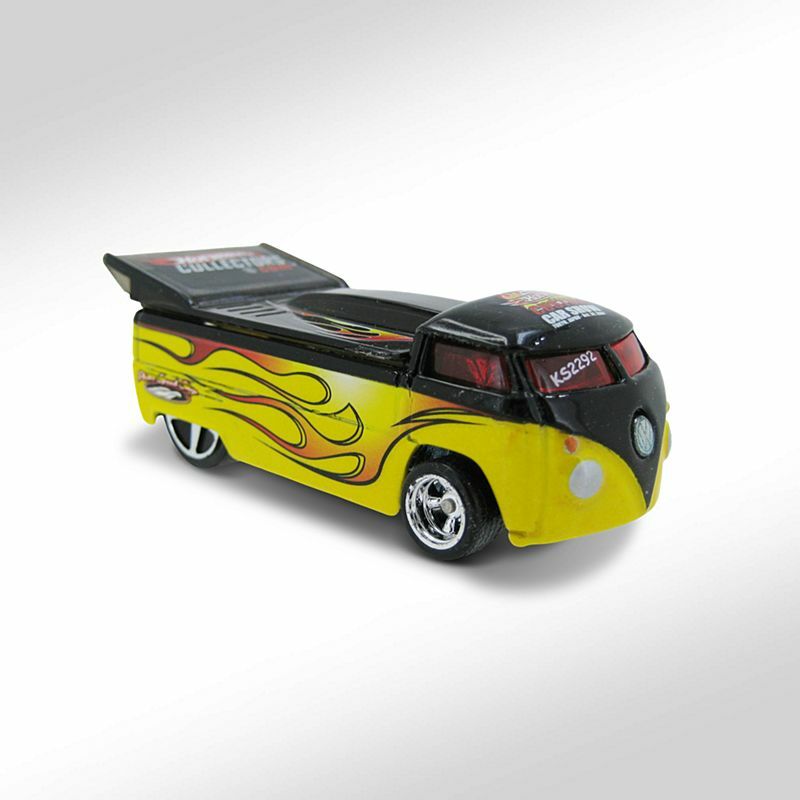 This edition of the Customized VW Drag Truck was released in yellow and black for the Official Hot Wheels® Custom Car Show in Tokyo, Japan on October 24, 2004. 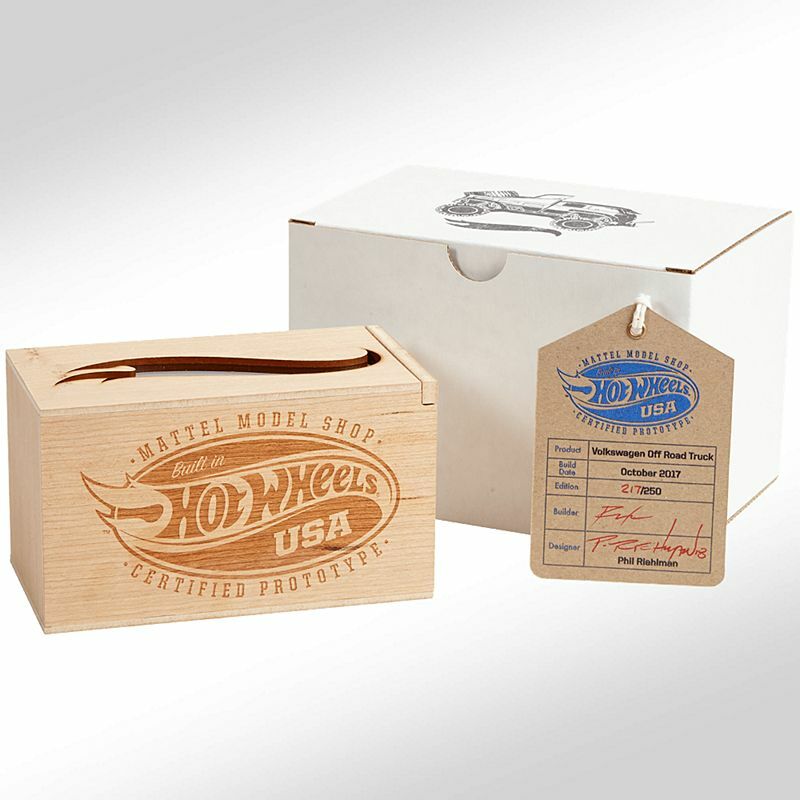 Released for charity at the 18th Annual Hot Wheels® Collectors Convention. 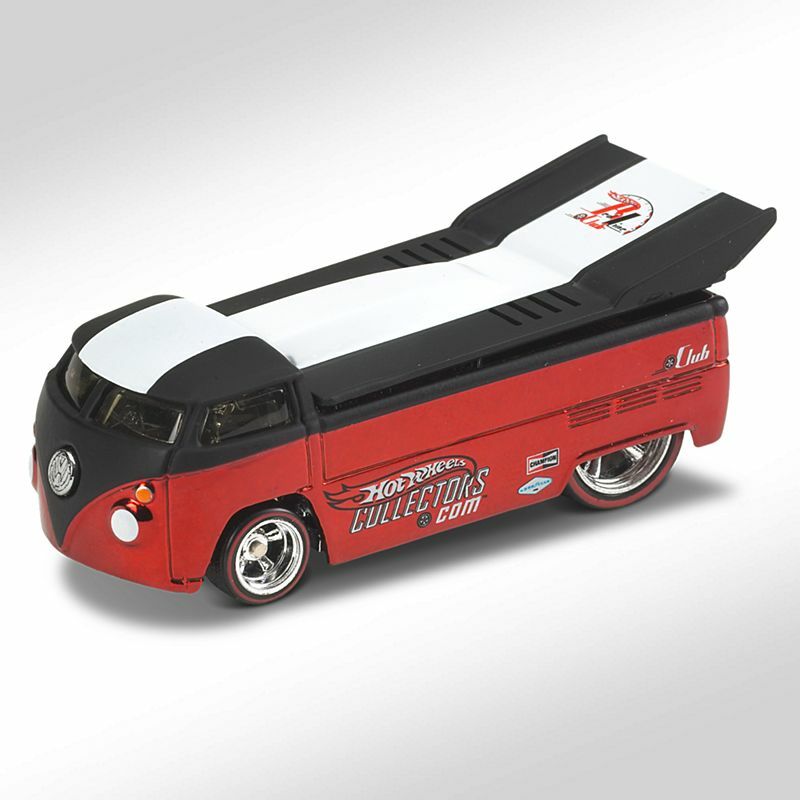 This Volkswagen T1 Drag Bus is the bonus vehicle for Red Line Club members who subscribed to HWC™ Series 10, the first year the Subscription Plan was offered. 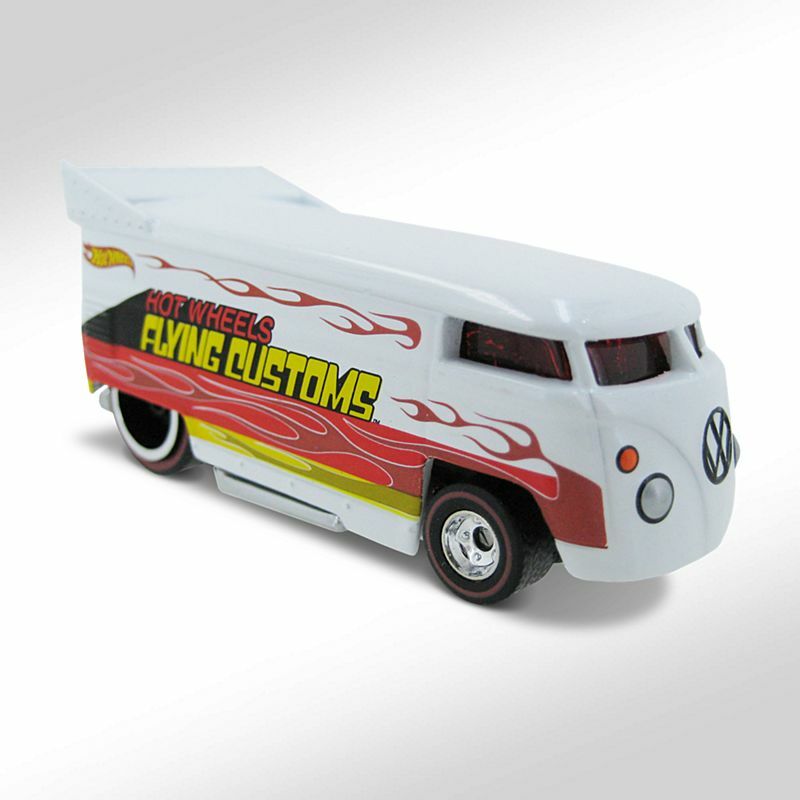 A Customized VW Drag Bus has been an annual tradition for HWC™ members since the Hot Wheels Flying Customs™ version debuted in 2002. The Real Riders® version of the Bus sports five-spoke chrome-like hubs surrounded by extra thick tires. 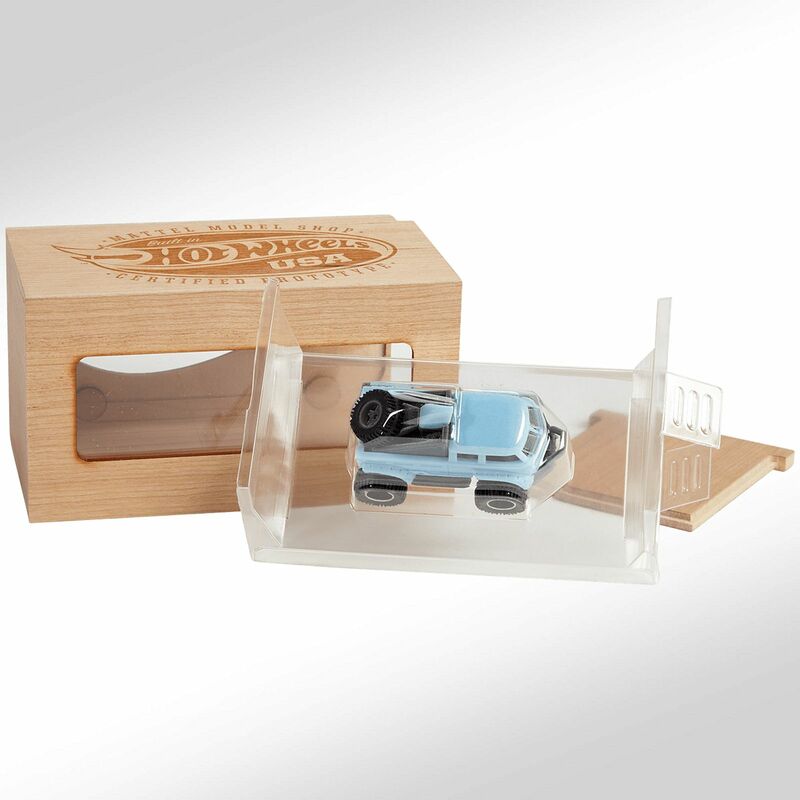 Hot Wheels® designer Phil Riehlman, who dreamed up the casting for 1996, designed these wheels especially for this release. 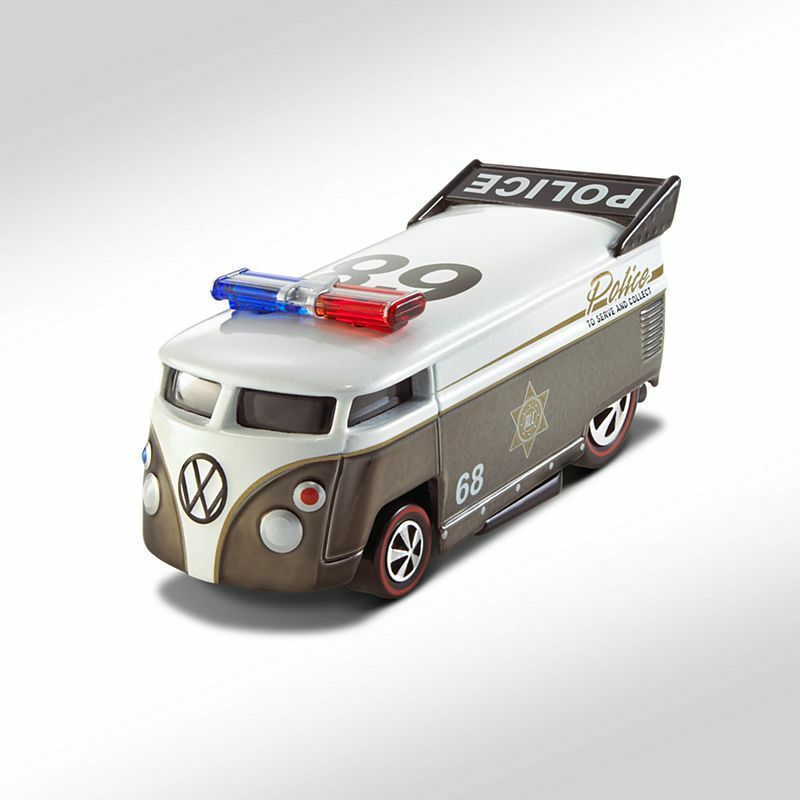 The heavy chassis and engine – signatures of the Bus — are plated with real chrome. 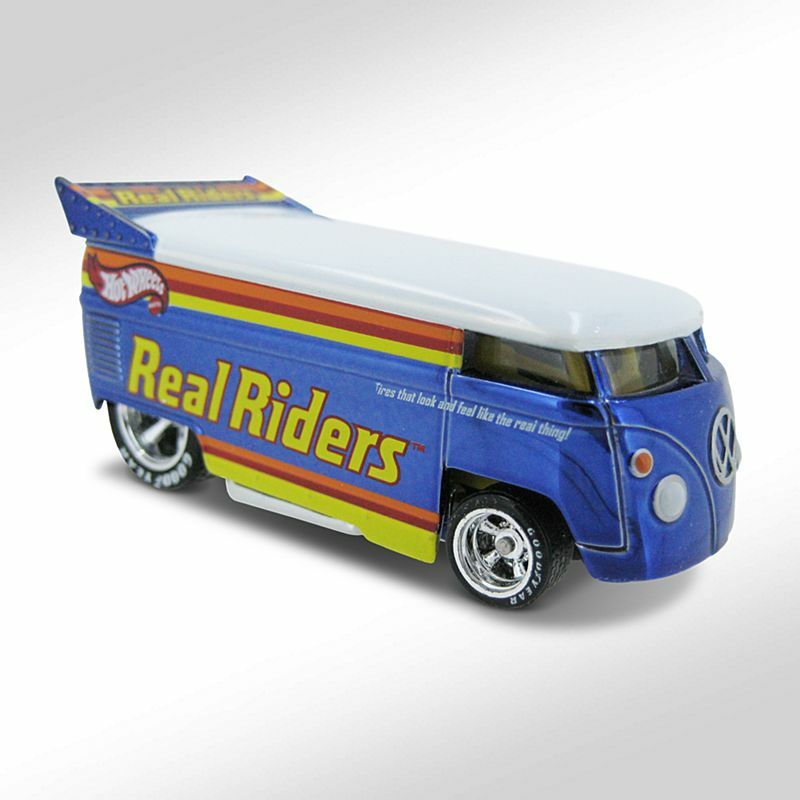 Tampo decoration for the Bus features the Real Riders® logo and stripes over brilliant Spectraflame® dark blue, as if this were the sponsor car for Real Riders® wheels. 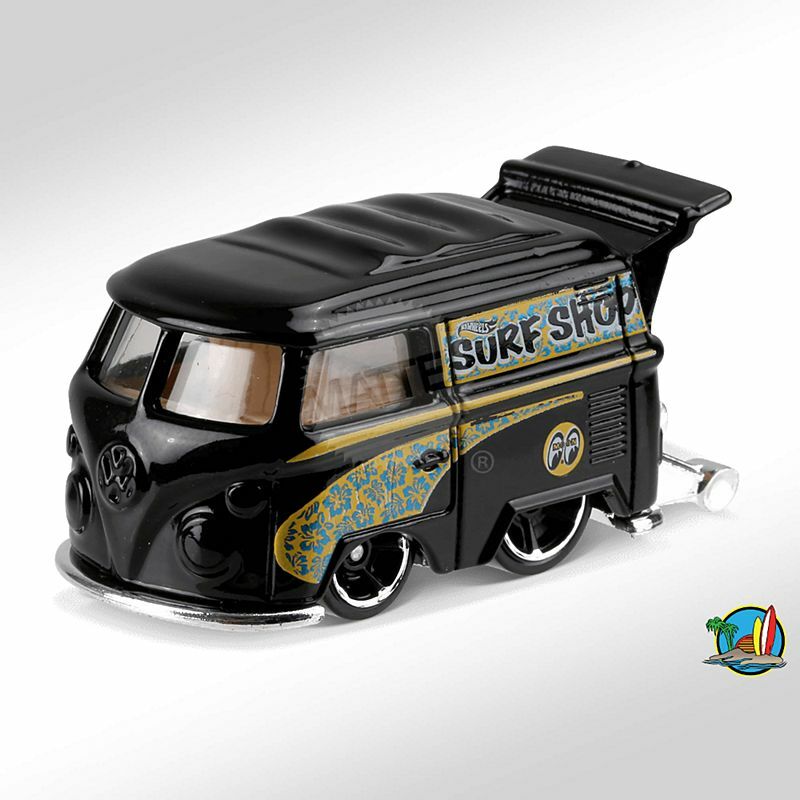 Designed by Jerry Thienprasiddhi, this all-chrome Customized VW Drag Bus pays tribute to one of the most memorable deco schemes in Hot Wheels history — the 1975 Toy Fair Super Van. This Customized VW Drag Bus was produced in Spectraflame® blue with Real Riders® deep-dish wheels with red stripe tampo on the front. 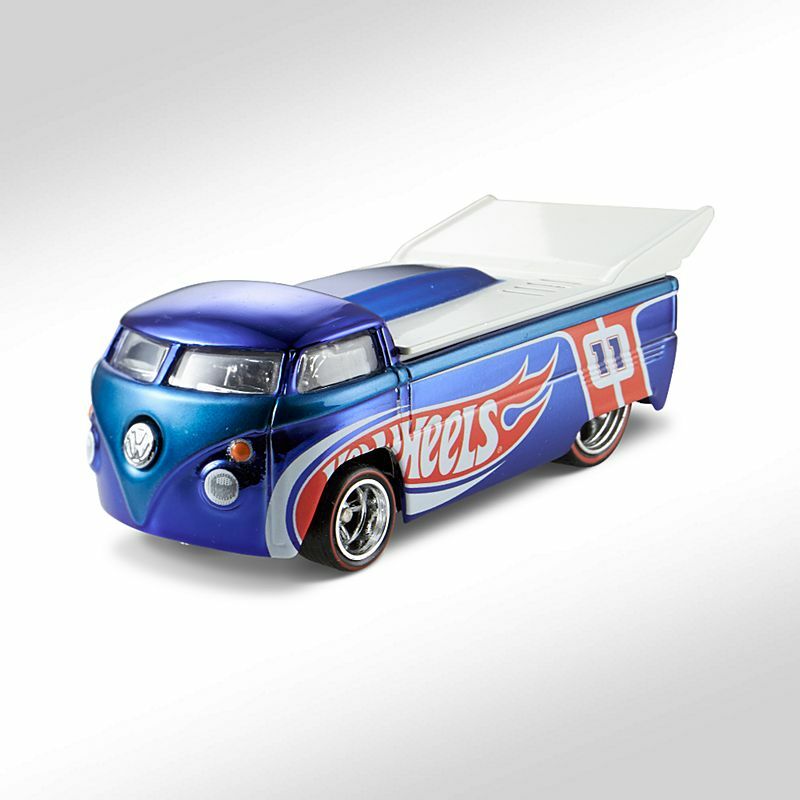 It is an alternate version of the casting released at the 2002 Hot Wheels Collectors Nationals to honor the casting’s designer, Phil Riehlman, by commemorating his 10th anniversary with Mattel. 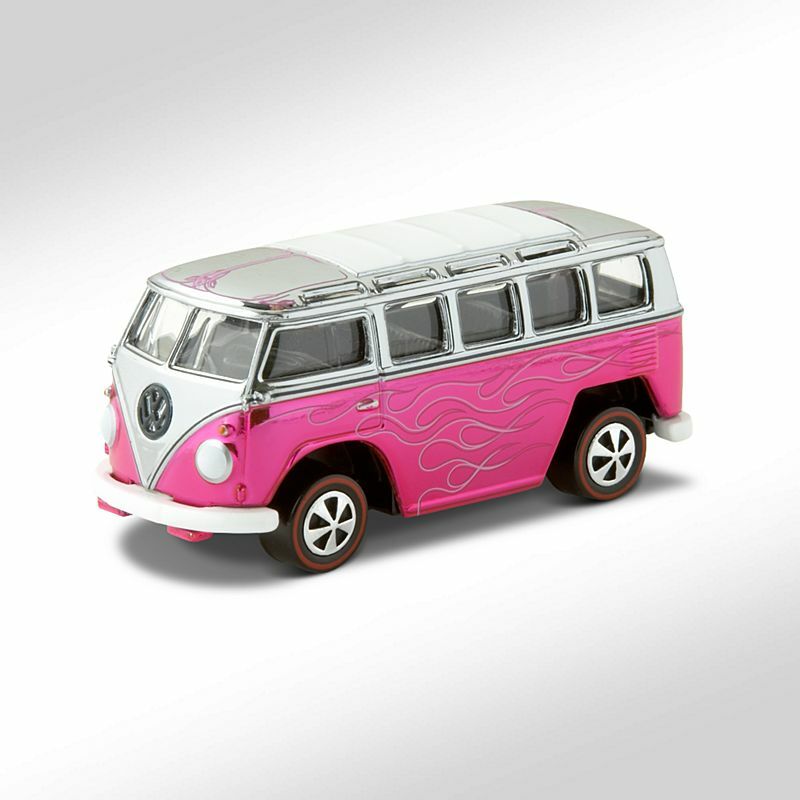 Vw Microbus HWC™ Series Seven Neo-Classics™ line. 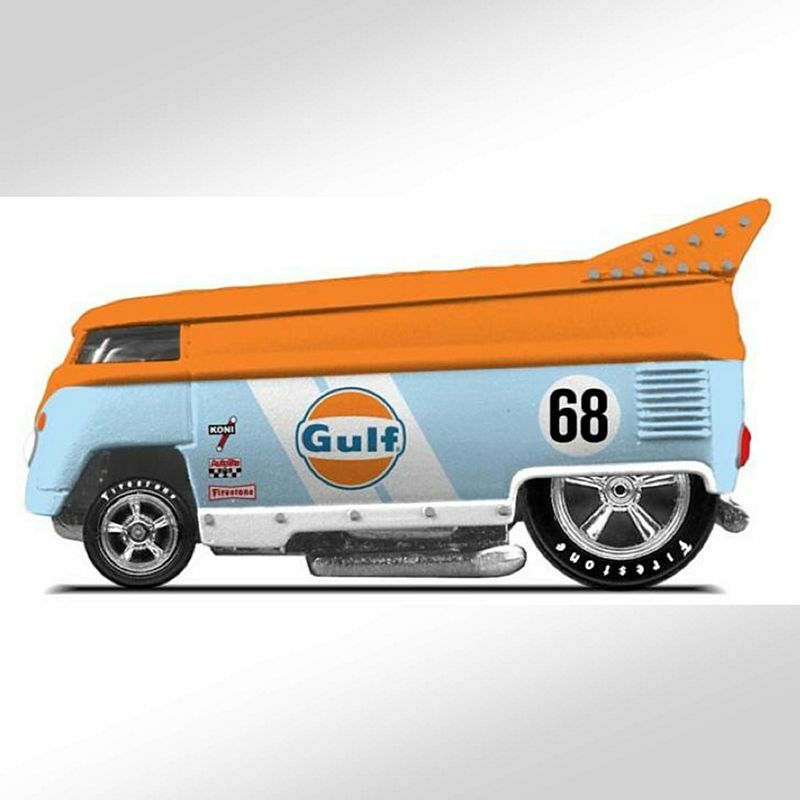 This Customized VW Drag Bus is from the 2003 Irvine Hot Wheels® Collectors Convention, released to promote the Hot Wheels® Hall of Fame Event. 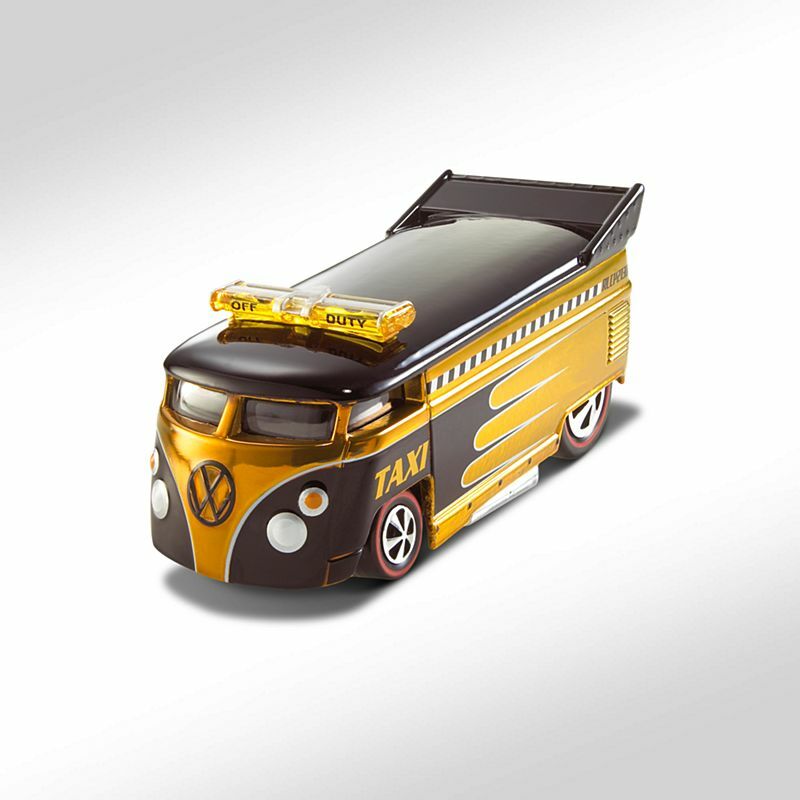 This 1:18 scale version of the popular Customized VW Drag Bus features a deco scheme that pays tribute to the memorable 1975 Toy Fair Super Van. 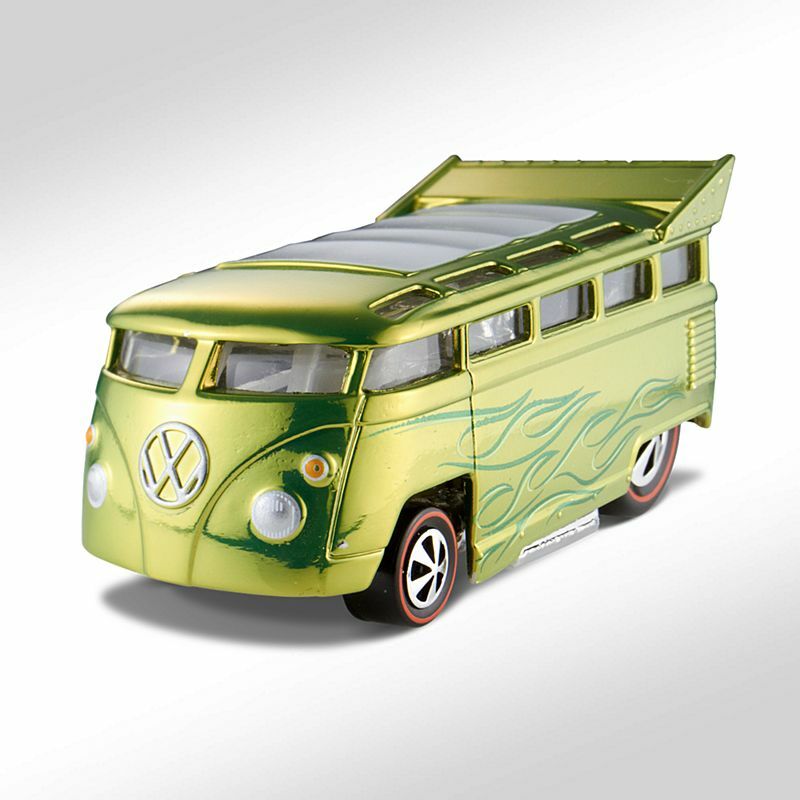 It is also a larger “brother” version of the 1:64 scale Customized VW Drag Bus released as part of HWC™ Series One. 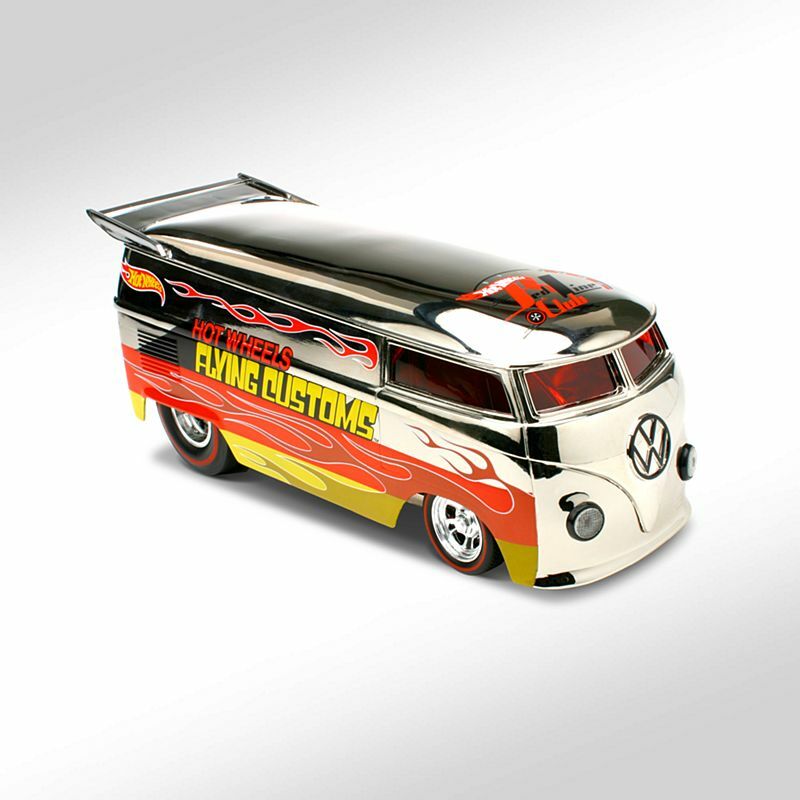 With a flat sheet of metal as his canvas, custom designer Dave Chang hand-painted each decorated side panel of this Customized VW Drag Bus in 4:1 scale.